Moody Gardens has entered the final phase of a $25 million enhancement project that will include a complete redesign of its popular Rainforest Pyramid, providing guest with a two-level experience to explore the rainforests of the world from both the ground and the sky. The newly enhanced attraction, to be unveiled in May 2011, will also include exciting new exhibits as well as more than 1,000 exotic plants and animals. One of the most dramatic transformations in the Rainforest Pyramid will be a new tree-top canopy entrance and trail that will take guests on a “bird’s eye” exploration of plant and animal life for an entirely new perspective of the attraction. 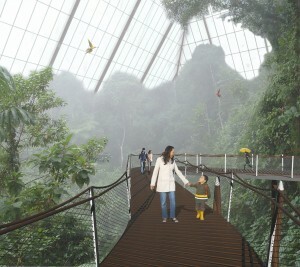 Along the 300-feet-long canopy walkway guests will be greeted by a variety of new exhibits and animals, including butterflies, leafcutter ants and bats that will fly from the tree tops to a new cave exhibit visible on the ground. A new Mayan exhibit will showcase the culture of the people who use the rainforest for survival. A new exhibit showcasing the endangered Chinese Alligator will be added along with a giant river otter pond that will allow guests to view these amazing animals from multiple vantage points. Learn about more changes coming to the Rainforest Pyramid by watching an exciting video tour. Click Rainforest Enhancement Video Tour to watch!